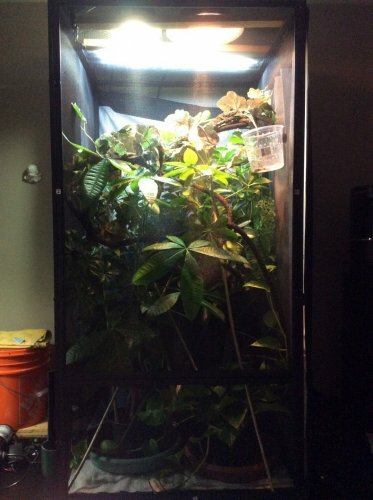 since I moved my Charm in his new XL Reptibreeze Enclosure on Friday he is only staying under the Basking spot. His Basking spot temp is between 81-85f . He doesn’t move and he is always rolling over to the side so he is out of side. I guess he is hiding from me. He was so active and always moving in his old Custom Enclosure with plexiglass. 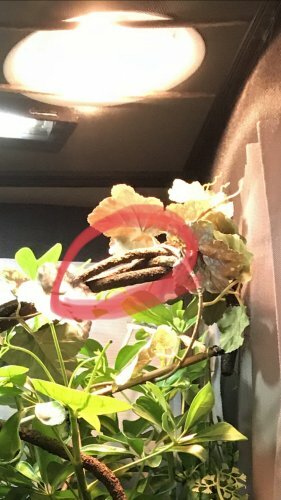 I have lots of coverage real plants lots of sticks and vines for him to climb around but he just stays at one spot and rolls to the side. I have a feeling he isn’t to happy at the moment. What can I do so he gets back to his old self? I will send pic of the old Enclosure and the new one now. From what I understand, chams don't like change. He needs to get used to his new home. Are you saying he has been in his basking spot ONLY since friday? The only time he moves is at night when he goes to bed. My cham angles his body so that it is perpendicular to his basking bulb so he can absorb more heat. He also flattens his body to help with this. I think your cham is doing the same because logically, an all plexiglass enclosure will be a LITTLE warmer than an all screened enclosure. My cham will also tilt sideways to hide from me, but I've also noticed him tilted sideways to warm up when I'm not in the room for a while and come back. I've noticed him tilting sideways for both reasons. 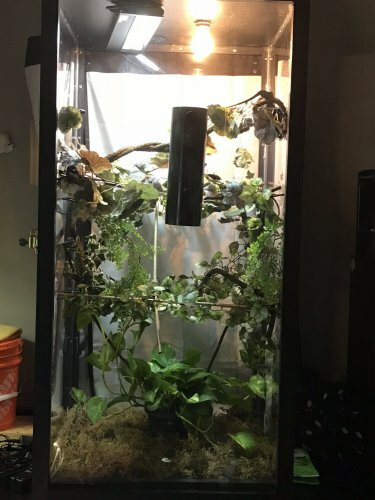 I'd give him some more time to adjust to his new enclosure,especially with a dramatic change in scenery, and maybe try increasing the basking temp a little like the others suggested. So I lowered the Basking lamp a bit and now the Basking spot area reaches from 84-90f depends on where he is. Is that to hot for him now? Hmmm... what’s the temp in the middle of the circle/basking spot? Edit: is the middle of the circle the highest spot that the bulb hits? Just be cautious of burns, but if you could raise the bulb a hair to make the hottest part 85-87*F, you’ll be perfect! Are you pointing the temp gun at the top of those vines and not the sides of them? You can get a big difference when you do that too.